The cockroach of predators? Coyotes now live in every state but Hawaii and thrive around human civilization, eating our garbage and sometimes, even our pets. Here's what you can do about the pesky critters. As Gareth highlighted a couple weeks ago, coyote populations have spread down the eastern seaboard where a new, larger species has taken over. These Eastern Coyotes are big enough to take down a deer, much less a toy poodle. Coyotes also live in cities, you'll even occasionally see them in Manhattan. At the risk of sounding like a fear monger, coyotes can also attack humans. While, like most other animal attacks, this is a very rare occurrence, 160 coyote-on-human attacks were documented nationally in the 30 years preceding 2006. To put that in perspective, the CDC says 4.5 million Americans are bitten by dogs each year. So, while the possibility is there, worry more about your cats, dogs and other animals. Here in Hollywood, lost pet signs are a common sight. Hate to break it to you, but Poochie the Pomeranian isn't missing, he was lunch. Coyote tracks are more oval in shape and have more pronounced claws than their domestic cousins. Basic Coyote Prevention: Most local governments ask residents to harass coyotes whenever and wherever they're seen. The idea is to keep them scared of people and away from places where we live. So, if you see a coyote, do everyone a favor and peg it with a rock. Never feed a coyote, it encourages them to see humans and our surroundings as a food source. You should also prevent coyotes from gaining a residence on your property or any you manage. Close up gaps under porches, sheds and similar with strong wire and bury that wire at least 18 inches underground too, to prevent them from digging under it. If there's open storm drains or similar in your neighborhood, you can also ask local authorities to close those up. Basically, the idea is to deny them a likely den area. Like bears, coyotes are also attracted by garbage and compost piles. Keep trash locked away in strong containers with secure lids and don't place it out on the curb until the morning of pickup. Encourage locals schools, businesses and such to do the same. Surround any compost piles with strong fencing at least six-feet tall. Clean up other sources of food for coyotes such as fallen fruit, pet bowls, and barbecue grills. Birdfeeders attract small birds, which coyotes eat, so by encouraging birds to live around your home, you're also encouraging the coyotes. Same goes for fish in outdoor ponds — don't do it, you're just providing a food source for them. Keeping Coyotes Out: Coyotes are smart, persistent and small. That means most fences and garden walls won't keep them out. A good rule of thumb is that anything a cat can get through or over, a coyote can too. Chain link fences should be at least six-feet tall and the links should continue to a depth of 18 inches under the ground, to prevent the coyotes from simply digging their way under. Topping the fence with barbwire or a Coyote Roller will prevent them from climbing over the top. Any gates in the fence should close with minimal gaps — your fist shouldn't be able to pass through — and latch securely. Coyote rollers top fences and keep the animals from gaining enough purchase to pull themselves over the top. An array of products designed to deter coyotes also exists. There's motion-sensor sprinklers, sound devices and scents. All will work to some degree but can't be relied on totally. Scents require frequent re-application, especially after rainfall. Sound makers will only deter coyotes for a short time before they adapt and a sprinkler won't do much against a determined predator with a kill in sight. Even if you believe your yard is safe, it's a good idea to supervise pets at dawn, dusk and at night. I know several people who have lost pets to coyotes out of their backyards here in Hollywood. Probably the most effective deterrent is simply going to be a big mean dog. A German Shepherd, Rottweiler, Akita or similar large breed known for its use as a guard dog will be effective at scaring off any coyotes. It's still a good idea to keep even large dogs away form the pests as they're known to carry rabies and other diseases and a determined pack of coyotes can take down even a large dog if they really want to. With Wiley at home — 85lbs of muscle and teeth — we don't really have to worry much about coyotes coming around or raccoons, possums or burglars either. If coyotes have settled in or around your property, call Animal Control or an exterminator. Keeping Cats Safe: Cats are clever and capable of amazing feats of acrobatic athleticism. Growing up, we'd occasionally see one of our toms tackle the local foxes. He'd come home with cuts and scrapes, but you wouldn't see the foxes again at all. Give your cat some basic tools and they'll be fine. Oh, and leave their claws on! To escape predators, cats just need something to climb. If you've got a big tree or trees in your yard, fine. If not, consider building a cat post — a pole standing seven feet high or so, covered or made from something the cat can climb (like sisal rope), with a flat platform on top for the cat to hang out on until the coyotes leave it alone. If you have a cat or dog door in your home, make sure it's shut and locked at night. Out On Walks: While hiking in the Hollywood Hills, Wiley and I often encounter a distraught owner frantically calling fluffy or whatever little dog they were silly enough to let off-leash around dawn or dusk. Fluffy ain't coming back, lady. Coyotes are most active at those time and at night, so simply keep your dog on-leash at dawn, dusk and while on nighttime walks. Even if you're just walking through your neighborhood. Here in LA, coyotes are known to use their own pups as lures, tempting dogs in with the possibility of play. A strong recall and a dog that's kept close to you should prevent this. Be especially wary of coyotes in and around chaparral and other dense foliage in which the coyotes can hide. In LA, that means all of Runyon Canyon, most of Griffith Park, all of Topanga and Malibu and most other areas too. Don't let your dog get out of sight in tall grass either. If you encounter a Coyote, draw yourself up to your full height and shout at it. Put your dog on its leash and back slowly away. Carrying or picking up a big stick helps too and you can also throw rocks. If it's a pack of coyotes, be particularly careful, make a lot of noise and back off from them. Never let a coyote get between you and your pet or child and never turn your back on one. 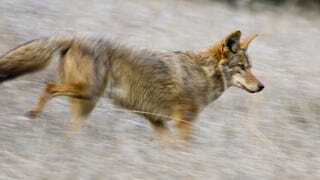 Mace, bear spray, whistles, air horns and garden hoses should all be capable of running a coyote off. IndefinitelyWild is a new publication about adventure travel in the outdoors, the vehicles and gear that get us there and the people we meet along the way. Follow us on Facebook, Twitter and Instagram.